Not to be confused with carotene, kerosene, chitin, creatine, keratan sulphate, collagen, or ketamine. Keratin (/ˈkɛrətɪn/) is one of a family of fibrous structural proteins. 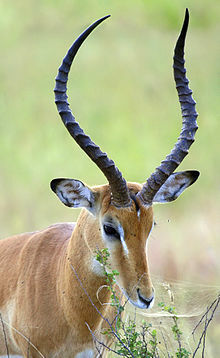 It is the key structural material making up hair, nails, horns, claws, hooves, and the outer layer of human skin. Keratin is also the protein that protects epithelial cells from damage or stress. Keratin is extremely insoluble in water and organic solvents. Keratin monomers assemble into bundles to form intermediate filaments, which are tough and form strong unmineralized epidermal appendages found in reptiles, birds, amphibians, and mammals. The only other biological matter known to approximate the toughness of keratinized tissue is chitin. The neutral-basic keratins are found on chromosome 12 (12q13.13). The acidic keratins are found on chromosome 17 (17q21.2). The human genome encodes 54 functional keratin genes which are located in two clusters on chromosomes 12 and 17. This suggests that they have originated from a series of gene duplications on these chromosomes. The keratins include the following proteins of which KRT23, KRT24, KRT25, KRT26, KRT27, KRT28, KRT31, KRT32, KRT33A, KRT33B, KRT34, KRT35, KRT36, KRT37, KRT38, KRT39, KRT40, KRT71, KRT72, KRT73, KRT74, KRT75, KRT76, KRT77, KRT78, KRT79, KRT8, KRT80, KRT81, KRT82, KRT83, KRT84, KRT85 and KRT86 have been used to describe keratins past 20. Protein sequence alignment of human Keratin 1, 2A, 3,4, 5, 6A, 7, and 8 (KRT1 – KRT8). Only the first rod domain is shown above. Alignment was created using Clustal Omega. The first sequences of keratins were determined by Hanukoglu and Fuchs. These sequences revealed that there are two distinct but homologous keratin families which were named as Type I keratin and Type II keratins. By analysis of the primary structures of these keratins and other intermediate filament proteins, Hanukoglu and Fuchs suggested a model that keratins and intermediate filament proteins contain a central ~310 residue domain with four segments in α-helical conformation that are separated by three short linker segments predicted to be in beta-turn conformation. This model has been confirmed by the determination of the crystal structure of a helical domain of keratins. 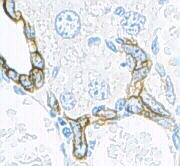 Keratin (high molecular weight) in bile duct cell and oval cells of horse liver. Fibrous keratin molecules supercoil to form a very stable, left-handed superhelical motif to multimerise, forming filaments consisting of multiple copies of the keratin monomer. The major force that keeps the coiled-coil structure is hydrophobic interactions between apolar residues along the keratins helical segments. Limited interior space is the reason why the triple helix of the (unrelated) structural protein collagen, found in skin, cartilage and bone, likewise has a high percentage of glycine. The connective tissue protein elastin also has a high percentage of both glycine and alanine. Silk fibroin, considered a β-keratin, can have these two as 75–80% of the total, with 10–15% serine, with the rest having bulky side groups. The chains are antiparallel, with an alternating C → N orientation. A preponderance of amino acids with small, nonreactive side groups is characteristic for structural proteins, for which H-bonded close packing is more important than chemical specificity. In addition to intra- and intermolecular hydrogen bonds, the distinguishing feature of keratins is the presence of large amounts of the sulfur-containing amino acid cysteine, required for the disulfide bridges that confer additional strength and rigidity by permanent, thermally stable crosslinking—in much the same way that non-protein sulfur bridges stabilize vulcanized rubber. Human hair is approximately 14% cysteine. The pungent smells of burning hair and skin are due to the volatile sulfur compounds formed. Extensive disulfide bonding contributes to the insolubility of keratins, except in a small number of solvents such as dissociating or reducing agents. The more flexible and elastic keratins of hair have fewer interchain disulfide bridges than the keratins in mammalian fingernails, hooves and claws (homologous structures), which are harder and more like their analogs in other vertebrate classes. Hair and other α-keratins consist of α-helically coiled single protein strands (with regular intra-chain H-bonding), which are then further twisted into superhelical ropes that may be further coiled. The β-keratins of reptiles and birds have β-pleated sheets twisted together, then stabilized and hardened by disulfide bridges. It has been proposed that keratins can be divided into 'hard' and 'soft' forms, or 'cytokeratins' and 'other keratins'. [clarification needed] That model is now understood to be correct. A new nuclear addition in 2006 to describe keratins takes this into account. Keratin filaments are intermediate filaments. Like all intermediate filaments, keratin proteins form filamentous polymers in a series of assembly steps beginning with dimerization; dimers assemble into tetramers and octamers and eventually, if the current hypothesis holds, into unit-length-filaments (ULF) capable of annealing end-to-end into long filaments. Metabolism ceases, and the cells are almost completely filled by keratin. During the process of epithelial differentiation, cells become cornified as keratin protein is incorporated into longer keratin intermediate filaments. Eventually the nucleus and cytoplasmic organelles disappear, metabolism ceases and cells undergo a programmed death as they become fully keratinized. 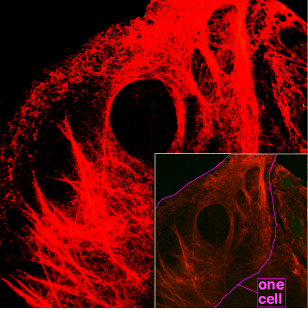 In many other cell types, such as cells of the dermis, keratin filaments and other intermediate filaments function as part of the cytoskeleton to mechanically stabilize the cell against physical stress. It does this through connections to desmosomes, cell-cell junctional plaques, and hemidesmosomes, cell-basement membrane adhesive structures. Cells in the epidermis contain a structural matrix of keratin, which makes this outermost layer of the skin almost waterproof, and along with collagen and elastin, gives skin its strength. Rubbing and pressure cause thickening of the outer, cornified layer of the epidermis and form protective calluses, which is useful for athletes and on the fingertips of musicians who play stringed instruments. Keratinized epidermal cells are constantly shed and replaced. These hard, integumentary structures are formed by intercellular cementing of fibers formed from the dead, cornified cells generated by specialized beds deep within the skin. Hair grows continuously and feathers moult and regenerate. The constituent proteins may be phylogenetically homologous but differ somewhat in chemical structure and supermolecular organization. The evolutionary relationships are complex and only partially known. Multiple genes have been identified for the β-keratins in feathers, and this is probably characteristic of all keratins. Silk found in insect pupae, and in spider webs and egg casings, also has twisted β-pleated sheets incorporated into fibers wound into larger supermolecular aggregates. The structure of the spinnerets on spiders’ tails, and the contributions of their interior glands, provide remarkable control of fast extrusion. Spider silk is typically about 1 to 2 micrometres (µm) thick, compared with about 60 µm for human hair, and more for some mammals. The biologically and commercially useful properties of silk fibers depend on the organization of multiple adjacent protein chains into hard, crystalline regions of varying size, alternating with flexible, amorphous regions where the chains are randomly coiled. A somewhat analogous situation occurs with synthetic polymers such as nylon, developed as a silk substitute. Silk from the hornet cocoon contains doublets about 10 µm across, with cores and coating, and may be arranged in up to 10 layers, also in plaques of variable shape. Adult hornets also use silk as a glue, as do spiders. Some infectious fungi, such as those that cause athlete's foot and ringworm (i.e. the dermatophytes), or Batrachochytrium dendrobatidis (Chytrid fungus), feed on keratin. Keratin expression is helpful in determining epithelial origin in anaplastic cancers. Tumors that express keratin include carcinomas, thymomas, sarcomas and trophoblastic neoplasms. Furthermore, the precise expression pattern of keratin subtypes allows prediction of the origin of the primary tumor when assessing metastases. For example, hepatocellular carcinomas typically express K8 and K18, and cholangiocarcinomas express K7, K8 and K18, while metastases of colorectal carcinomas express K20, but not K7. Keratin is highly resistant to digestive acids if it is ingested (Trichophagia). Because of this, cats (which groom themselves with their tongues) regularly ingest hair which will eventually result in the gradual formation of a hairball that is occasionally vomited when it becomes too big. Rapunzel syndrome is an extremely rare but potentially fatal intestinal condition in humans that is caused by Tricophagia. ^ Entry "keratin" in Merriam-Webster Online Dictionary. ^ Fraser, R.D.B. (1972). Keratins: Their composition, structure and biosynthesis. Bannerstone House: Charles C Thomas. pp. 3–6. ISBN 978-0-398-02283-9. ^ a b Wang, Bin (2016). "Keratin: Structure, mechanical properties, occurrence in biological organisms, and efforts at bioinspiration". Progress in Materials Science. 76: 229–318. doi:10.1016/j.pmatsci.2015.06.001. ^ "Keratin". Webster's Online Dictionary. ^ Vincent, Julian F.V; Wegst, Ulrike G.K (July 2004). "Design and mechanical properties of insect cuticle". Arthropod Structure & Development. 33 (3): 187–199. doi:10.1016/j.asd.2004.05.006. PMID 18089034. ^ Tombolato, Luca; Novitskaya, Ekaterina E.; Chen, Po-Yu; Sheppard, Fred A.; McKittrick, Joanna (February 2010). "Microstructure, elastic properties and deformation mechanisms of horn keratin". Acta Biomaterialia. 6 (2): 319–330. doi:10.1016/j.actbio.2009.06.033. PMID 19577667. ^ Hickman, Cleveland Pendleton; Roberts, Larry S.; Larson, Allan L. (2003). Integrated principles of zoology. Dubuque, IA: McGraw-Hill. p. 538. ISBN 978-0-07-243940-3. ^ Kreplak, L.; Doucet, J.; Dumas, P.; Briki, F. (July 2004). "New Aspects of the α-Helix to β-Sheet Transition in Stretched Hard α-Keratin Fibers". Biophysical Journal. 87 (1): 640–647. doi:10.1529/biophysj.103.036749. PMC 1304386. PMID 15240497. ^ Moll, Roland; Divo, Markus; Langbein, Lutz (2008-05-07). "The human keratins: biology and pathology". Histochemistry and Cell Biology. 129 (6): 705–733. doi:10.1007/s00418-008-0435-6. ISSN 0948-6143. PMC 2386534. PMID 18461349. ^ a b Schweizer J, Bowden PE, Coulombe PA, et al. (July 2006). "New consensus nomenclature for mammalian keratins". J. Cell Biol. 174 (2): 169–74. doi:10.1083/jcb.200603161. PMC 2064177. PMID 16831889. ^ Hanukoglu, I.; Fuchs, E. (Nov 1982). "The cDNA sequence of a human epidermal keratin: divergence of sequence but conservation of structure among intermediate filament proteins". Cell. 31 (1): 243–52. doi:10.1016/0092-8674(82)90424-X. PMID 6186381. ^ a b c Hanukoglu, I.; Fuchs, E. (Jul 1983). "The cDNA sequence of a Type II cytoskeletal keratin reveals constant and variable structural domains among keratins". Cell. 33 (3): 915–24. doi:10.1016/0092-8674(83)90034-X. PMID 6191871. ^ Lee, CH. ; Kim, MS.; Chung, BM. ; Leahy, DJ. ; Coulombe, PA. (Jul 2012). "Structural basis for heteromeric assembly and perinuclear organization of keratin filaments". Nat Struct Mol Biol. 19 (7): 707–15. doi:10.1038/nsmb.2330. PMC 3864793. PMID 22705788. ^ Hanukoglu I, Ezra L (Jan 2014). "Proteopedia: Coiled-coil structure of keratins". Biochem Mol Biol Educ. 42 (1): 93–94. doi:10.1002/bmb.20746. PMID 24265184. ^ "Secondary Protein". Elmhurst.edu. Archived from the original on 2010-09-22. Retrieved 2010-09-23. ^ "What is Keratin?". WiseGEEK. Retrieved 11 May 2014. ^ Australia. "Spiders – Silk structure". Amonline.net.au. Archived from the original on 2009-05-08. Retrieved 2010-09-23. ^ Shiratsuchi H, Saito T, Sakamoto A, et al. (February 2002). "Mutation analysis of human cytokeratin 8 gene in malignant rhabdoid tumor: a possible association with intracytoplasmic inclusion body formation". Mod. Pathol. 15 (2): 146–53. doi:10.1038/modpathol.3880506. PMID 11850543. ^ Itakura E, Tamiya S, Morita K, et al. (September 2001). "Subcellular distribution of cytokeratin and vimentin in malignant rhabdoid tumor: three-dimensional imaging with confocal laser scanning microscopy and double immunofluorescence". Mod. Pathol. 14 (9): 854–61. doi:10.1038/modpathol.3880401. PMID 11557780. ^ Omary MB, Ku NO, Strnad P, Hanada S (July 2009). "Toward unraveling the complexity of simple epithelial keratins in human disease". J. Clin. Invest. 119 (7): 1794–805. doi:10.1172/JCI37762. PMC 2701867. PMID 19587454. Wikisource has the text of the 1920 Encyclopedia Americana article Keratin.